We all want to run without getting injured! To help get you closer to running more injury-free, its wise to run with less impact. This is why I love forefoot running because it’s a running style, used by most elite runners, that produces results that matter for injury prevention as compared with heel strike running. But what is a forefoot strike? What does the physical mechanics of a forefoot strike landing look like during running and why its verifiably a safer style of running as compared with heel strike running? Initial ground-contact occurs on the balls of the foot, just ahead of the arch in a forefoot strike landing pattern during running. It’s VERY important to underscore that the very first part of the forefoot to make initial contact with the ground is on the outer-side, or lateral edge of the forefoot just under the 5th and 4th toe! A forefoot strike landing in running is when foot position is horizontal, or parallel with the ground upon touchdown (as shown below). One of the surest ways to make sure you land on your forefoot while running is to slightly point the front of your foot (i.e. your forefoot) downwards toward the ground upon and at touchdown! This helps you pin-down a forefoot strike that’s more on target and is most effective at deterring you from making initial ground-contact heel first. At touchdown during forefoot running, the balls of the foot lands first, but overall, the landing configuration of a proper forefoot strike is a much flatter foot-placement (not landing high up on the toes) as compared with a heel strike landing (landing heel first) whereby a heel strike landing, used by most joggers, is a more vertical placement of the foot upon and at touchdown and results in rapid braking as well as unusually prolonged braking and ground-contact time and explosive impact peak forces that heavily assaults the knee. In contrast, forefoot striking during running provides a safer base that is less concentrated in high impact forces and makes a lasting difference in countering heavy loads on the knee, which is why runners knee is significantly less prevalent in forefoot runners! In looking in closer detail of a forefoot strike landing pattern during running, the lateral edge or outer-side of the forefoot makes initial ground-contact, then shortly after, the heel lowers down to the ground. More specifically, the region of the forefoot to make initial ground-contact is toward the outer-side, or lateral edge of forefoot, just under the 5th-4th metatarsal heads followed by the flattening of the rest of the foot with the ground (shown below). Why is making initial ground-contact on the OUTER-SIDE of the forefoot important in running? Lieberman et al., found that by landing on the forefoot with initial ground-contact under the 5th-4th metatarsal heads followed by dropping the heel to the ground, reduced both jarring and deceleration forces, preventing the body from coming to a dead stop, thus helping to narrow down knee-slaughtering impact loads. After the outer-side of the forefoot has made initial ground-contact, the rest of the underfoot completely flattens down to the ground with the heel being the LAST part of the foot to connect with the ground. 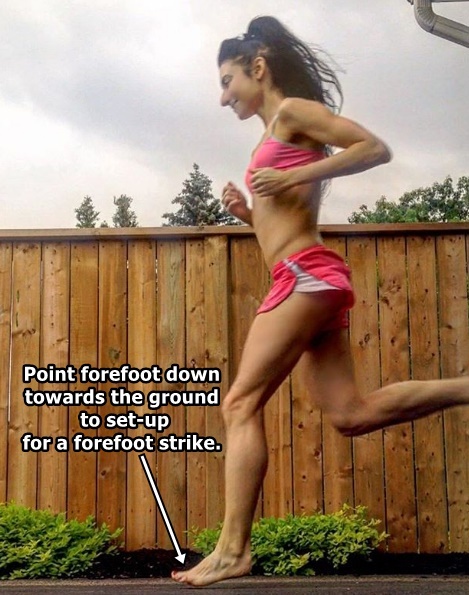 Get a High-Precision Forefoot Strike by Running Barefoot! To improve your forefoot strike accuracy and to program it deep into your muscle memory, I always suggest to run barefoot on pavement! You have to remember that humans evolved as barefoot runners –at one time, barefooting was universal, running shoes weren’t! Our ancestors ran barefoot on hard tundra whereby natural selection has favored certain mechanical defenses against high impacts when our ancestors ran barefoot on harder surfaces, the forefoot strike being one of them! Intense evolutionary pressure forced our ancestors to develop any kind of traits that could improve survival while running barefoot. It’s fundamentally the forefoot strike that led to human’s evolutionary success as endurance runners as it enabled our ancestors to run barefoot after prey without ANY added risk of injury. Therefore, because of the less impact factor, there’s a good chance that humans are more well-adapted for forefoot running, not heel strike running, even to this day! And, there’s the fact that many of East African professional runners grew up running barefoot and most of them developed enhanced forefoot running skills that are more impact-protective than most of the runners of the first world where shoes are a first priority! 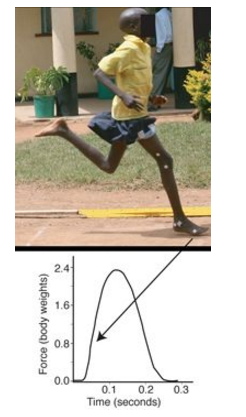 In my opinion, their (the East African runners) biomechanics are led by having ran barefoot extensively during youth and is one of the main reasons these runners suffer FAR less injury and compete in MORE races per year. Barefoot running has kept the best runners in the world winning! East Africa has produced many of the best runners in the world, but what’s not in doubt is that running barefoot during youth has a big role to play in their success as adult runners! In a landmark study, Dr. Lieberman discovered that habitual barefoot runners from Kenya made initial ground-contact on the outside of the forefoot. This landing pattern resulted in the complete elimination of the impact transient (an injurious impact variable) associated with heel striking, enabling them to run barefoot on ANY surface without strife! SOURCE: Lieberman et al (2010). The picture with the diagram above is from an incredibly well-known compelling study by Lieberman et al. who analyzed the foot strike pattern between habitual barefoot runners from Kenya and habitually shod (shoe) runners. He concluded that East African runners grow up running barefoot and strike the ground with their forefoot, particularly on the outer-side of the forefoot, whereas most shod runners execute a heavy heel strike that produces more impact. In fact, pretty much ALL barefoot runners land on the outside of the forefoot when making initial contact with the ground, before lowering of the heel. Never lose sight at the fact that most barefoot runners share a similar forefoot strike landing movement path which strongly indicates this specific landing pattern is reflexive and hardwired due to evolutionary selective pressures! In my view, you have to invest in barefoot running if you want to achieve real results for the benefit of renewing your foots role in forefoot running, for helping you maintain the ability to run with less impact long-term AND observing, in awe, the biomechanics of most East African runners is an example of that investment! It’s for this reason we can use the barefoot-derived forefoot strike running mechanics of most East African runners as a point of reference to help us learn the proper way to run! 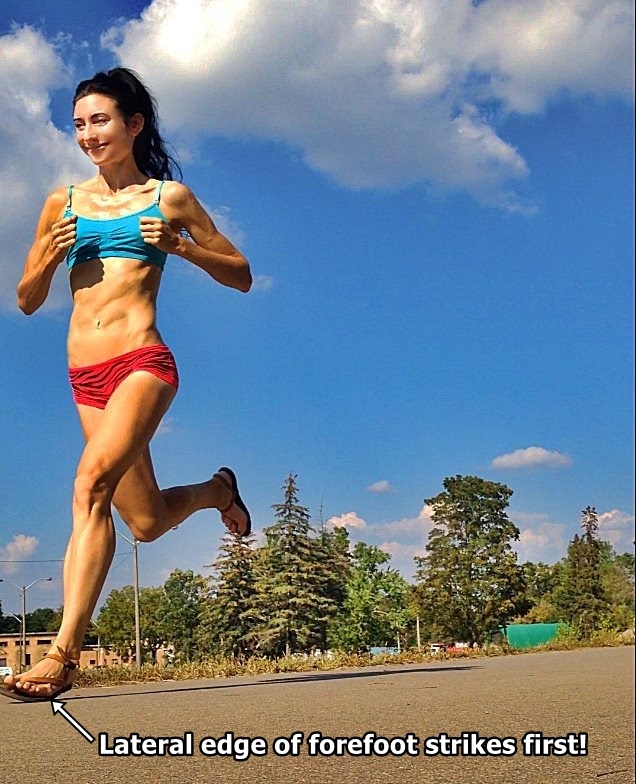 To help lock down a more on-target forefoot strike and to fully prevent you from landing heel-first during running, I strongly urge you to try running barefoot on pavement and remember to NOT lift your forefoot up upon and at touchdown, rather point your forefoot down or keep it parallel with the ground. Note that when you run barefoot, the toes, NOT the forefoot, reflexively lifts up slightly upon touchdown to get out-of-the-way, helping set-up the foot to land ahead of the arch. For an even better depiction of a forefoot strike, below, is a video of the forefoot strike landing pattern of Tirunesh Dibaba (she’s the runner in the middle with the black & white Nike’s). Dibaba, from Ethiopia, also grew up running barefoot and lands on the sides of her forefoot. In the video, just before Dibaba’s forefoot contacts the ground, notice she DOES NOT lift her toes as heel strikers often do upon heel strike. Dibaba has her foot-ankle complex relaxed (the feet should feel relaxed and floppy), her feet effortlessly fall to the ground. Essentially, Dibaba is not forcing any movements in her foot, nor does she drive or rush her foot to the ground. It just falls . Another tip is Dibaba does not land high up on her toes, rather, her foot placement at foot strike is much flatter as mentioned earlier. Some forefoot running learners mistake forefoot running as toe running (or ‘tippy-toe’ running as I call it) and end up landing higher on their toes without letting the rest of the foot flatten to the ground! The problem with tippy-toe running is that its just as injurious as heel strike running as your calves will soon feel blow-torched. If your calves are sore, you could be landing too high up on the balls of your foot, or toes. Don’t do that anymore! Aim for a more flatter foot strike, but avoid heel contact first! In my opinion, Dibaba’s forefoot running style is the textbook example of forefoot, and barefoot running mechanics. She is among the best in the world and I prefer to learn from the best because how Dibaba runs has a lot to do with why she is so great. To help you execute a proper forefoot strike landing, you can run barefoot or run in barefoot-simulated footwear. Here are the benefits of running barefoot as well as some great additional barefoot running learning resources. And finally, here are my reviews and recommendations on barefoot-feeling running shoes for forefoot running. Hope these tips help with your forefoot, or barefoot running progress! Why Try Barefoot Running – Find out how barefoot running gives you more stability control and power to handle forefoot running injury-free. Heel Striker’s Problems – Landing on the heels when running is really a crash landing. Find out what kind of injuries are the result of heel striking. Why I Like Forefoot Running – Read my reasons why forefoot running is the way humans were meant to run. Heel Strike vs Forefoot Strike – Find out how forefoot running offers more impact reduction than heel strike running. Lieberman et al. Foot strike patterns and collision forces in habitually barefoot versus shod runners. Nature (2010); 463: 531-535. G’Day Bretta, i really enjoy your articles & videos of your barefoot “fore foot” running style……very imformative! i can see the improvement in your gait for the better, running barefoot , do you prefer barefoot in most of your routines , walking, etc.? Ever since I started brisk walking in a pair of Umara Trail sandalsin April – I started getting severe hip pain near my SI Joint. I used to walk heel first. I later switched to forefoot walking but the lateral edge near the pinky hurts (i think its the joint). 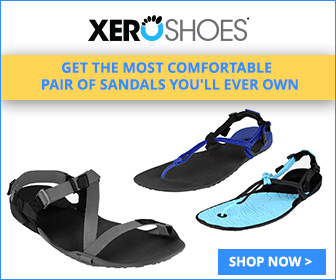 I somehow think its the lack of cushioning in xero and the fact that city roads, pavements are not designed for barefeet walking. Please share your thoughts. Im almost ready to abandon my xeros and switch back to regular shoes. I find all my pain problems correct when I wear regular shoes. Maybe they’re better designed for tar n concrete roads. I was running slow on the forefoot and now the top of me feet have been in pain and swelling. Any ideas?